The eccentric club owner has once again made it to the hot topics currently trending on social media after he should up for a friend’s wedding in the most unlikely fashion ever. 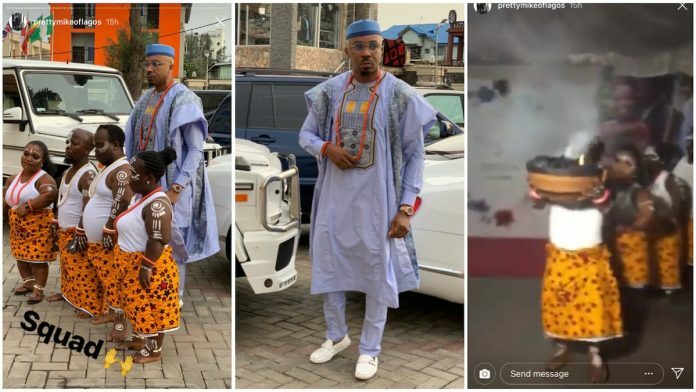 Currently trending on social media are several videos of the the socialite showing up at the venue of the reception with four dwarf all dressed in similar attires. As he proceeds into the wedding party hall, one of the dwarfs leads the way with a calabash that has some items burning in it which could easily pass for a typical sacrifice. Recalls a few years back, the young man who seems to enjoy controversy, stepped out to a wedding with his two ladies on a leash. The ladies who wore matching pink dresses and masks, didn’t seem to mind being held by the chain around their necks, as they moved in front of their ‘owner’.